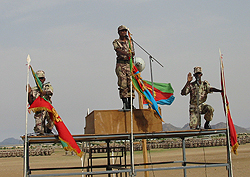 President Isaias Afwerki today presided over the graduation ceremony of the 18th round of participants of the National Service (NS) program who completed their military training and 12th grade academic courses. Speaking at the graduation ceremony, the President underlined that a citizen has dual responsibilities, namely personal and collective, which he must fulfil. In this connection, the President noted that a citizen who fulfils his or her duty in Sawa comes out as a gratified and responsible person. 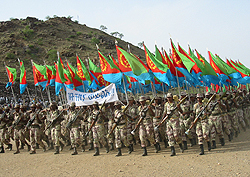 Regarding the outcome of the past 18 rounds of the NS program, President Isaias said that the participants were nurtured in Sawa and made vital contribution in efforts to safeguard peace and national sovereignty. Earlier the Commander of the Training Center of the EDF, Brig. General Negash Tesfatsion outlined the history and heroism of the nation's youths and the significant contributions they are making in national development endeavors within the framework of the Warsay-Yikaalo Development campaign. Similarly, Col. Debesai Ghide, commander of the NS Training center, explained the achievements made by the graduating batch. 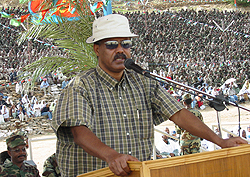 NS participants who achieved excellence received prizes from President Isaias and ministers. 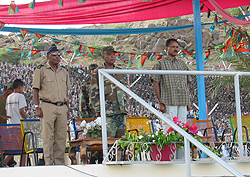 Present on the occasion were Ministers, Army commanders, regional administrators and invited guests.